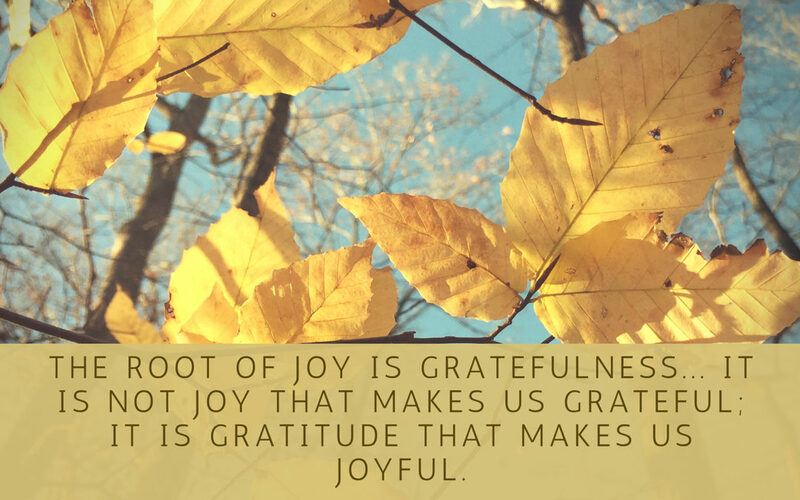 It’s the week of gratitude! Gratitude is one of the greatest forces for good in our human existence. … gratitude is a deeper, more complex phenomenon that plays a critical role in human happiness. Gratitude is literally one of the few things that can measurably change people’s lives. Dr. Emmons did numerous studies and was able to show that people who regularly kept a gratitude journal were 25% happier than those who kept track of their hassles or did nothing at all. He also showed that people in the habit of expressing gratitude reported feeling closer and more connected to people, had better relationships, were more likely to help others, felt less lonely, felt less depressed, slept better, and were more pleasant to be around. There are 3 crucial ways that gratitude is a life changer. First, gratitude helps us realize the fleeting nature of this life. Every experience we have is temporary and subject to change. An attitude of gratitude brings us into the here and now, the present moment, to fully experience and savor things that inevitably will come to an end. It helps us see the miraculous in the mundane. Second, gratitude connects us to the things that are real and enduring. There is a common thread that binds each fleeting moment— the thread of God’s infinite love for us, our intimate connection to the whole human family, and to the natural world around us. A sense of gratitude helps us feel that connection in every moment if we pay attention. As you sit and read this, bring yourself into the present moment and find gratitude for what is right in front of you. My friends, I am filled with joy! Just these few brief seconds looking at the trees out my window, contemplating the eons of human creativity that have led to the amazing conveniences I enjoy, and looking at just one of my sweet children lights me up inside with more than pleasure– it’s joy.